Shark-cage diving looks set to start in Nelson Mandela Bay soon. Port Elizabeth-based Raggy Charters was at the Tourism Indaba in Durban yesterday to market the new venture, the first of its kind in the Eastern Cape, which it has won the right to launch. Raggy Charters boss Lloyd Edwards said the bustling winter population of great white sharks around Bird Island, the crystal clear water in the area and the decade of research underpinning the operation would make it a world-class attraction. 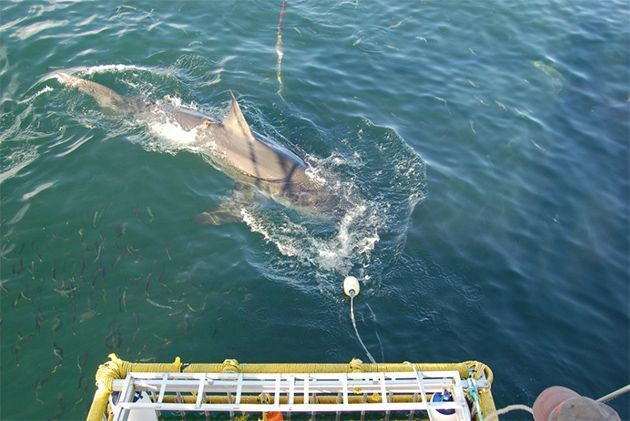 The Department of Environmental Affairs has been mulling the possibility of a shark cage-diving operation for Algoa Bay ever since SANParks began extending the Addo Elephant Park to the bay at Woody Cape in the late 1990s. Edwards and the Raggy Charters team, who also hold one of two boat-based whale-watching licences for Algoa Bay, are constructing the new shark diving cage. It would be winched down from their vessel into the sea at the identified site 8km offshore in the east of the bay, he said. The operation will run from April to September when great white sharks start congregating around Bird Island for easy pickings during the annual Cape fur seal pupping season. Edwards said chumming would be undertaken to attract the sharks, but the site was too far out for it to increase shark activity around any swimming beaches. With Bird Island home to the biggest gannet colony in the world, St Croix Island home to the biggest African penguin colony and Algoa Bay the unofficial global capital of the bottlenose dolphin, the area was set for a tourism boom, he said.